– Bug Fix: A Bug prevented to deploy EAR, WAR, ZIP… FILE was ok.
– Bug Fix: New files composing EAR, WAR, ZIP wasn’t detected correctly. – Remove navigation in the context menu. The ‘SCAWS pattern deployer’ allows you to connect to one or multiple SCAWS instances, retrieves the available patterns, deploy and delete them. 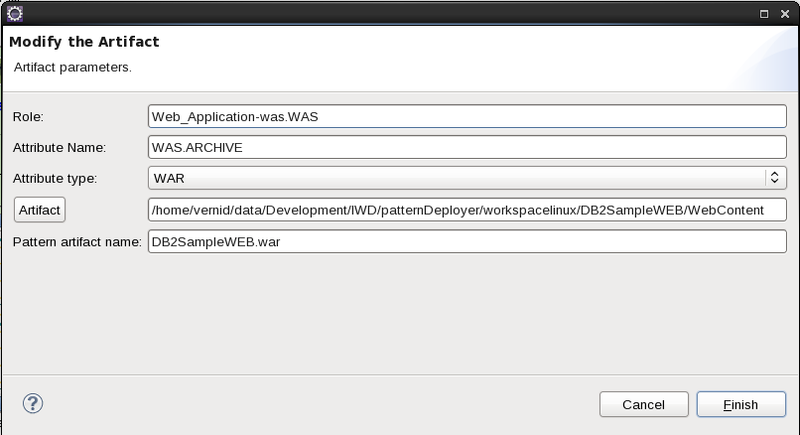 If the pattern has artifacts, the tool can upload new version of the artifact in the pattern instance or pattern. The tool can monitor your local copy of the artifact and can automatically upload them on the pattern instance if a new version of them is generated. The artifacts are not limited to EAR/WAR/JAR/OSGi files, they can be any type of files. In the plugin, you can define also a directory as artifact and in that cases, the plugin will compress the file as a EAR/WAR/JAR or ZIP file. Going beyond this plugin using RationalApplication Developer. A forum has been created for Q&A here (SCE Access requested). This entry was posted in IBM SmartCloud Application Services and tagged #DevOps, #ibmcloud, #SCAS, #SCAWS by ITDoVe. Bookmark the permalink.